A stunning contemporary vacation home that will pass as a dream house. What are the top most features that you consider the most in choosing your dream house? Are you looking for a vacation house and at the same time a residential home? Or you are searching for a house that is very close to nature? I guess that this is what most of us want for a dream house. A dream house that maybe best for your vacation and at the same time your place where you can spend quality time with your family even if it’s just a simple weekends only, right? Now we are going to tour you in a vacation home that is situated very close to nature. Unique feature: The house project is uniquely designed and built for the family who ideally wish to have a vacation and a comfortable residential home. 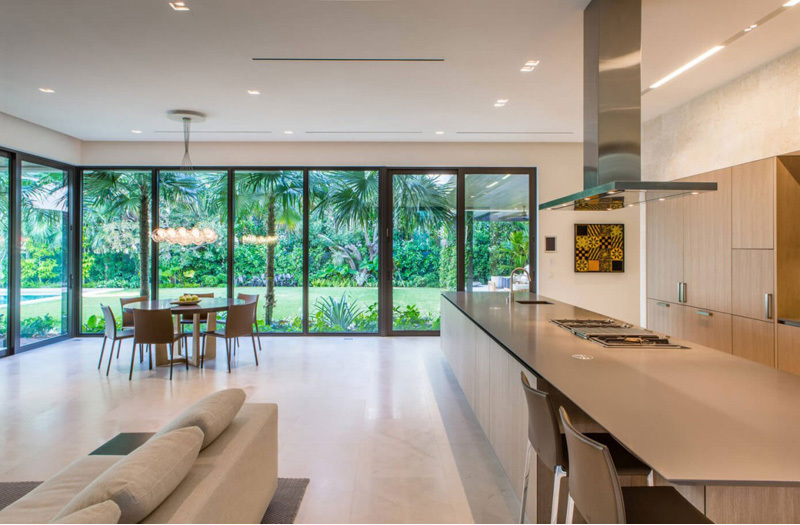 This house presented well the luxurious and stylish design of a home that is usually seen in a tropical place like Florida. See the front area of the house as it speaks of surprises and charm in the interiors. 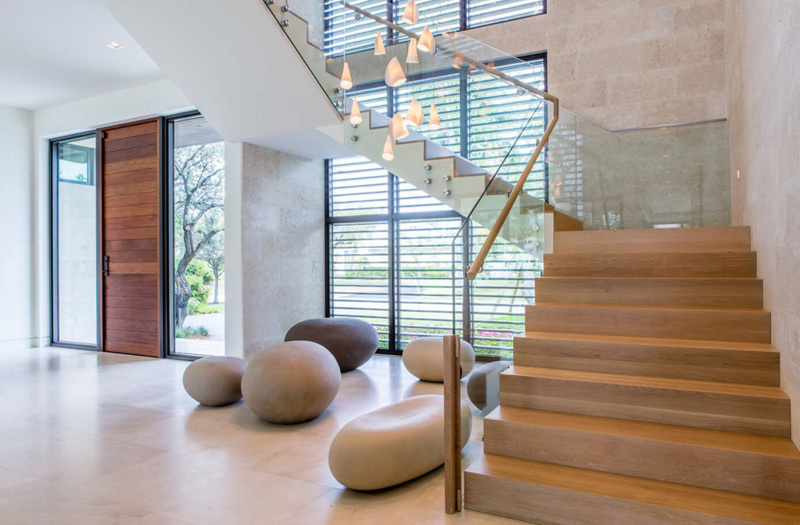 The wooden and concrete materials are utilized to make this house look so stunning and durable. 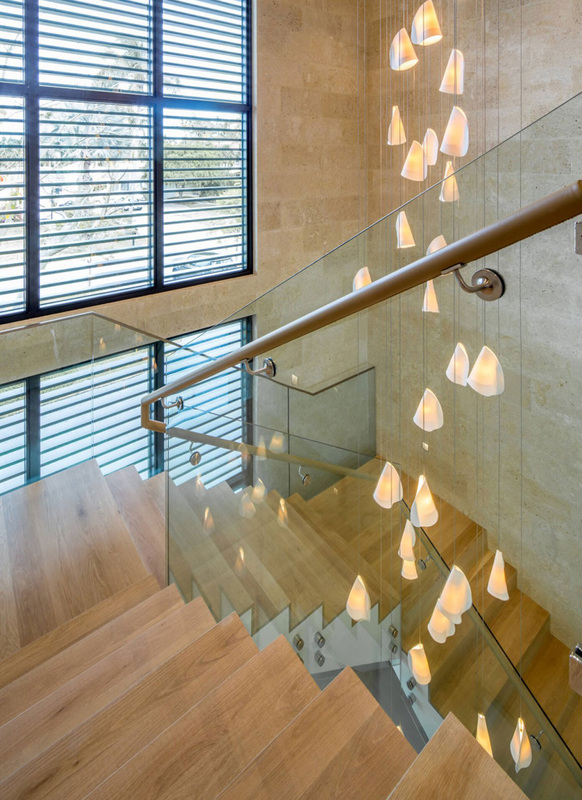 Elegant seats that look like stones and pebbles are arranged perfectly near the staircase with charming lamps. Huge dining-living space is offered in this interior where you can see a comfortable and spacious area where one can witness the sunset and sunrise. The lights installed in the ceilings remarkably highlighted the quality materials of the furniture and other accessories. Take a look at this clean and flawless kitchen! 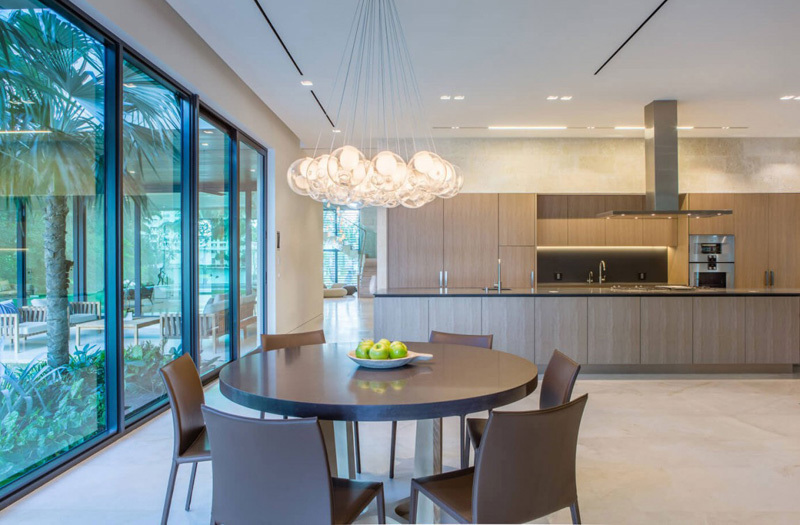 Trendy and stylish materials of the fixture and appliances are featured here. 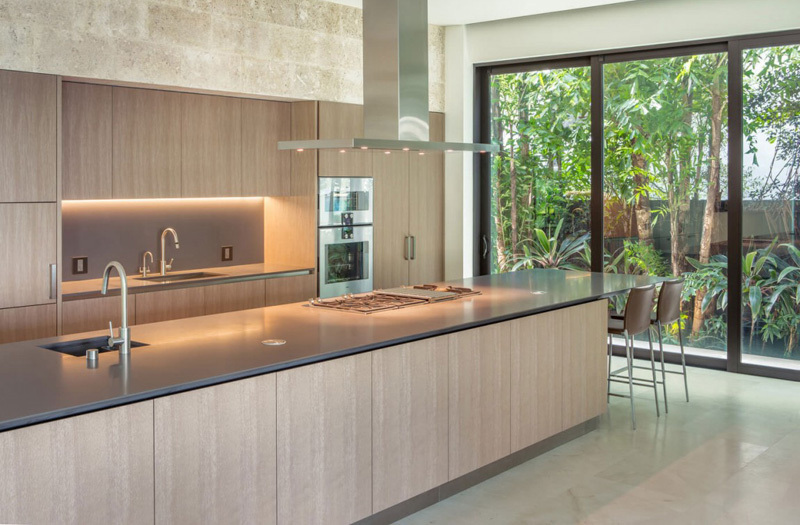 The homeowner may certainly enjoy preparing the meal in this modern-typed kitchen. Here’s a round table for six people that serve as one of the best spot in the dining-kitchen space. The expensive chandelier helps in making this space look so enchanted and elegant, too. The unique lamps above the staircase area may reveal not just the great style but more surprising features in the second level of the house. Another glimpse of the kitchen and dining space in the morning where the homeowner can exclusively witness the green views in the garden through its glassed walls. Here’s the huge bed that magnificently offers the oceanic views in the exterior. See how the designer mix and match the carpet, bed sheets and the pillows that represent earth colors. Take a look at the modern art display in the wall of this interior as you go to the second floor of the house. The lines in the floor and well-arranged lights in the ceilings coordinate with each other that made this space more appealing. Here’s one of the lovely bedroom of the homeowner’s children where books are arranged perfectly on the shelves. Light colors are applied in the accessories and walls to maintain comfort. Light blue and white colored mosaic tiles are applied in this bathroom. 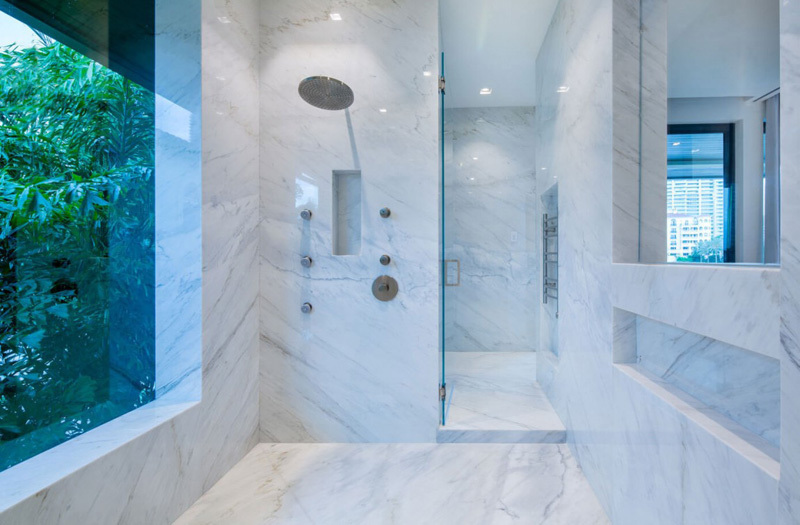 The trendy fixtures and the glass enclosure in the shower area stressed its modern and stylish bathroom design. 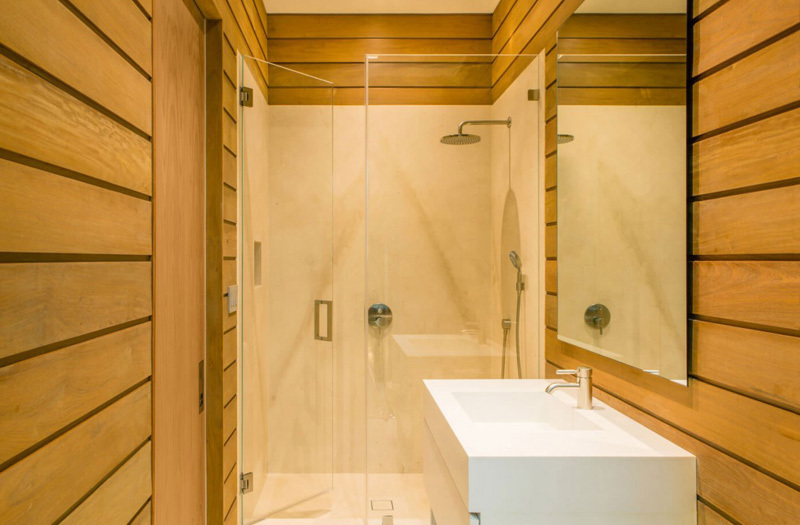 Here is another bathroom in the house and you may notice that the designer used wooden and glass materials to achieve comfort and contemporary bathroom. 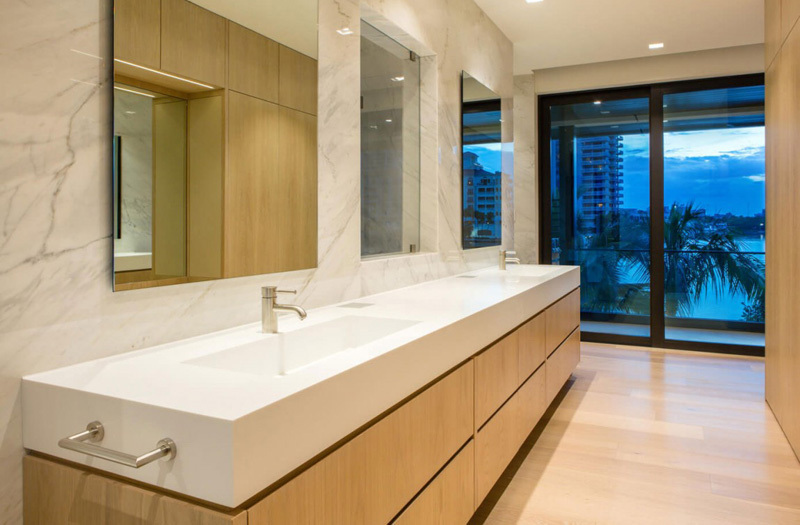 See the shape of the mirrors that carefully complement with the sink and fixtures in this wash area. The beauty of nature is still available in this bathroom as you see the glassed walls near the terrace. 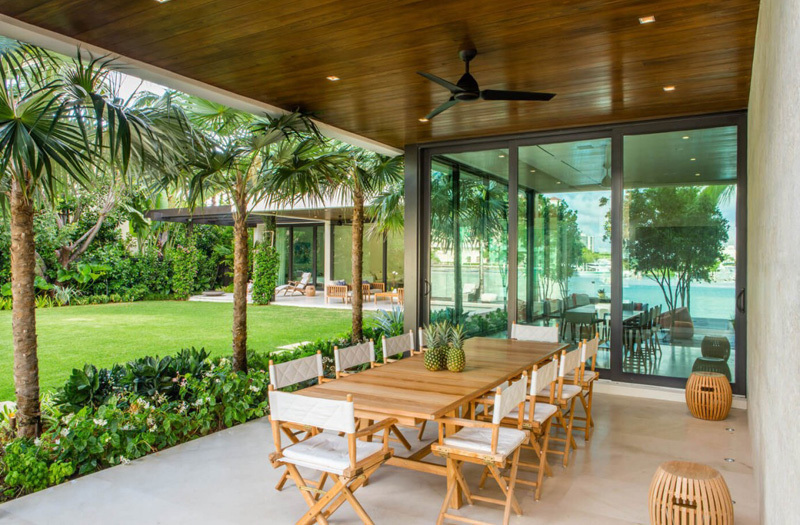 At the patio area, this is the perfect space where this wooden and modern dining table is set to celebrate party and weekend treats for the homeowner’s family and friends. Take a look at the edge and lines presented in the house building. 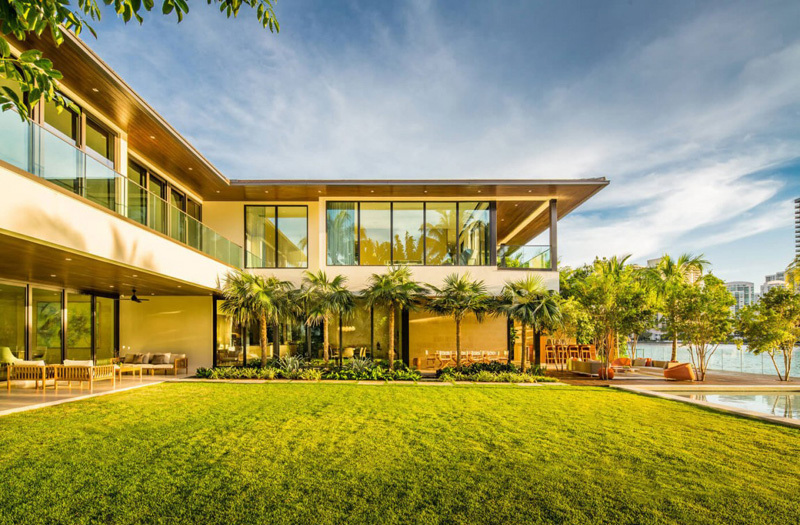 The palm trees complements with the green grass in the exterior as it blends well with the materials utilized for the area. 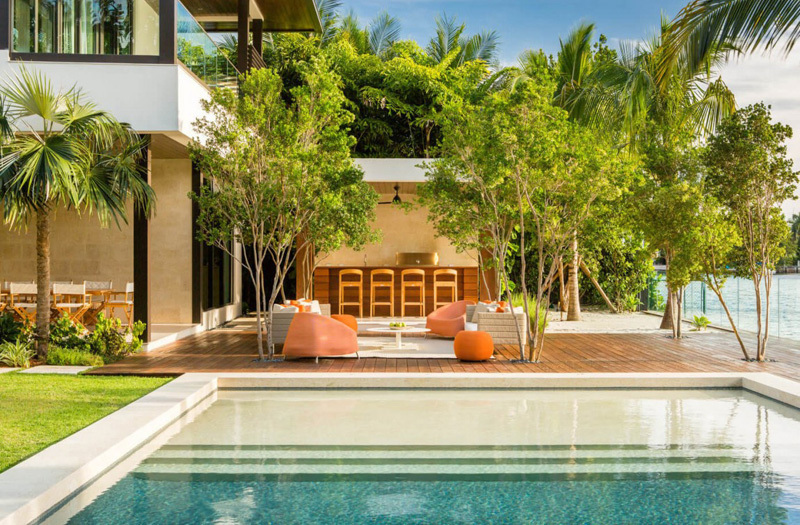 Modern seats are placed in the terrace for the homeowner to freely experience and witness the surprisingly elegant looking pool area and the breathtaking ocean. You can also see that there is orange furniture set in the pool area near the mini wine area in the exterior. Great ambiance is certainly awaited when the dark comes. Would you like to stay in this area in the late afternoon? Certainly, this area is always the best spot in the house where comfort and inspirational views are offered. To relieve from stress and worry, this swimming pool in the garden is set to offer the best experience even when the vacation or weekend holiday is over. 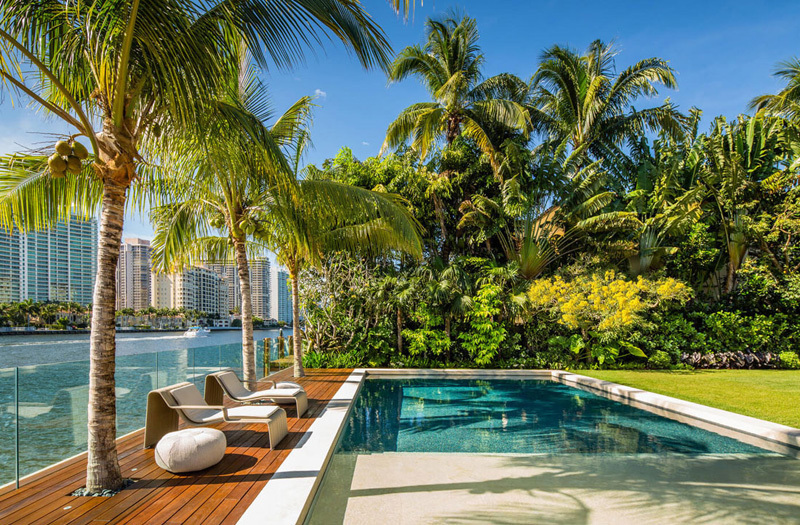 The color of the tiles used in this huge swimming pool blended well with the green plants and trees in the area. Even at night, the lights installed in the exterior define its captivating charm and elegance. As we have witnessed the different parts of the house, we may say that the Kobi Karp has successfully completed the house project as per requirements and requests by the homeowner. Personally, I like the charming and green views in the pool area. The resort-style escape was totally achieved in the exterior. 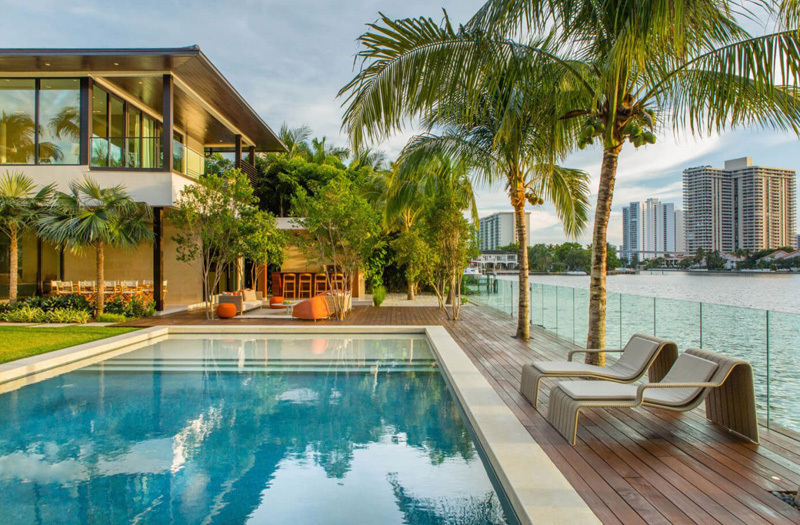 A complete package of privacy, comfort, and Miami retreat is well presented in this house design. The homeowners may certainly not just enjoy their house but will also feel relaxed in this awesome home. We hope that this house design may give you another set of inspirational ideas of what should a dream home would be like.